Bryce, Boswell is Required Reading Today (4/30)! I’ve mentioned writer/reporter Tom Boswell before. 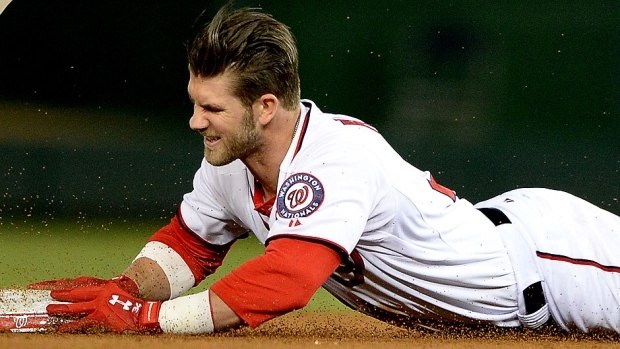 He is a gifted observer of our national pastime, and today’s piece on Bryce Harper is another gem. I hope Bryce takes it to heart. Now Harper Out for Two Months! This latest news is a huge blow to the Nats chances for fighting their way to the playoffs. Both Zim and Bryce got seriously hurt sliding headfirst. Doug Fister and Wilson Ramos are on the road back however. It seems possible that Fister could start a game by about May 7th. Ramos is practicing “lightly.” It will likely take him several more weeks to regain the strength needed to bat with power in game conditions. But he hopes to appear in minor-league games this week. This is the time for the bench players to step up and show us why they made the roster coming out of Spring Training! I have to admit, after hoping the Nats would trade Danny Espinosa before Spring Training, that he has made me VERY GLAD he is still here! I did not think it would be possible to make Danny a major league hitter, but I was wrong:) I’m impressed with the improved hitting thus far. And we all know he is a gold glove calibre fielder. In fact many of the usual suspects posting on the team website are calling for Danny to REPLACE Ian Desmond at SS! Late breaking news: Zack Walters has been sent down to Syracuse as well as Taylor Jordan. Ryan Mattheus is back up here. The last time Mattheus pitched well was in 2012; I hope they don’t have to use him in a critical situation. Maybe they want to have him in case they need a “mop-up” pitcher in a game that has got out of hand:) I also hope they bring Souza back. Ross Ohlendorf is 31 years old, has pitched for three different Major League Baseball teams and has been a part of six MLB organizations. He has a solid major league résumé, yet calling him a “farmhand” still wouldn’t be totally off-base. The career journeyman, who signed a major league deal with the Washington Nationals during this past offseason, is also a rancher. 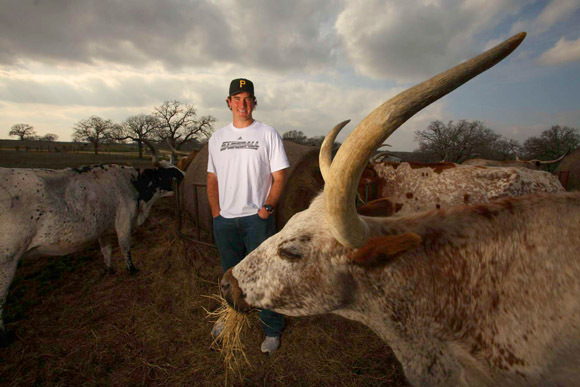 He raises longhorn cattle on his family’s ranch in Austin, Texas. Although his schedule is usually filled from March through September, Ohlendorf still spends his offseasons helping with the livestock care. For many years Ross Ohlendorf and his dad Curtis have worked with the same tenacious demand for quality in the cow herd at their Rocking O Ranch outside of Austin, Texas as Ross has worked to put a pitch in the upper ninety mph speed right on a 2″ target. These genetic details are revealed in quality cattle and cheering fans. Ross was a very effective pitcher for the 2013 Nationals. With an old-fashioned windup (that reminds me of when I was pitching back in the dark ages) and mid-90s heat on his fastball, he started a few games and also came out of the bullpen. The windup plus heat combination would upset the timing of many hitters and that was the key to his effectiveness. The team sure could use him right now! He’ll be on the disabled list (DL) until mid-May with a back strain. Ross is one of 4 major leagers who went to Princeton. And there are several more playing in the minors today. This school has (surprise!) turned into a significant producer of baseball talent. Only 12 schools in the country have more than 4 former students playing in the majors. The coach, Scott Bradley, played major-league ball for eight years and is clearly doing a good job. Matt Williams cost the Nats the game last night (April 21). In the 8th inning Tyler Clippard was on the mound. An Angels rally was gathering steam with two dangerous left-handed batters coming up (Aybar and Raul Ibanez). Ibanez is a well-known “Nats-Killer”. Everyone knows Clippard is having serious problems with Lefties, especially this year. The Nats had 3 left-handed pitchers in the pen and Cedeno was all warmed up. But Matt stuck with Clippard! I was screaming at my TV! I think even my 5-yr old grandson would have brought in Cedeno 🙂 So the bottom line is the Angels proceeded to score 4 runs as both batters came through with base hits, and Ibanez hit his over Bryce’s head in left field! Ian Desmond’s 2 errors in the inning didn’t help! But errors happen, while manager decisions are avoidable. 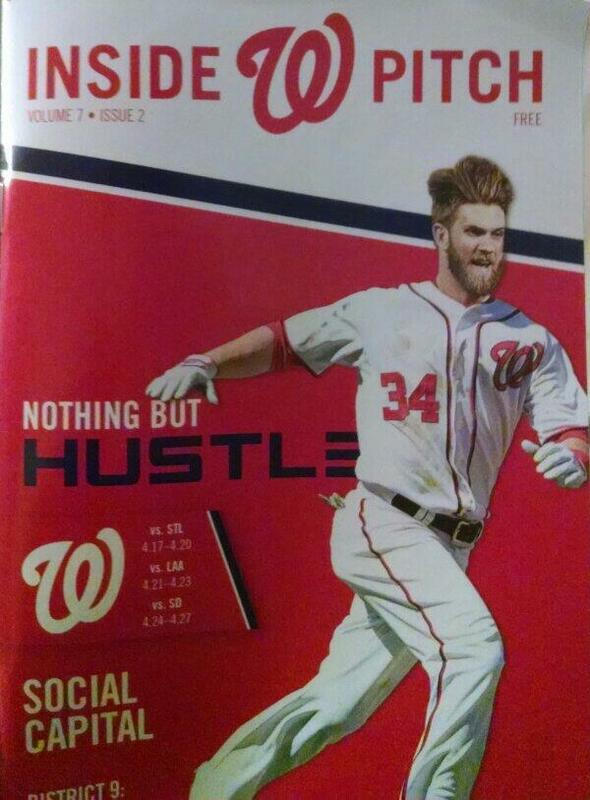 Ironic cover of the Nationals’ magazine that came out on April 17! In the press conference after the game both were asked about the incident. And both said the right things, Matt explaining what he expects of his players (maximum hustle) and Bryce saying Matt did the right thing (essentially admitting he screwed up). The media tried to say that since Bryce would have come to bat in the ninth with a chance to win the game and that Bryce let his team-mates down. I say that’s nonsense because Frandsen has been hitting very well in clutch situations. In fact, he hit well in this situation yesterday, getting an RBI! The game on April 17 was the Nats worst since before they got hot in August 2013. I could see from their body language that by the fifth inning they had given up. Starting pitching was supposed to be a team strong point, but it certainly hasn’t been this year. The starters’ ERA is near the bottom in all of baseball. The Nats are losing the first two innings by a huge margin as their pitchers try to get comfortable with their pitches and feel for the release-point. Manager Matt Williams stressed defense during Spring Training, but the team has more errors than any team in baseball right now. He also emphasized aggressive base-running, and the Nats have only stolen one base thus far and their star third-baseman Ryan Zimmerman ran himself right onto the DL with a broken finger. Adam Laroche has been thrown out at home three times already. One wonders what the third-base coach is smoking when he keeps waving the slowest guy on the team towards home! In 17 games I have stopped counting the base-running miscues. After the game, knowing the manager had called a team meeting right after the last out, he was then asked by a sportswriter what they had discussed. “That’s for me and my team to know” was his red-faced response. Zach Says I Ain’t Going Back to Syracuse! I think Zach has a good chance now of sticking on the 25-man roster for a while. It doesn’t hurt that he and Matt Williams have a history going back to when both were in the Arizona Diamondback’s system. In the “Ex-Nats News Department” I watched local guy Steve Lombardozzi (from Columbia, Md) play with the Orioles yesterday. He got a base hit and has been starting at 2B a lot this year, due to Manny Machado’s injury. Steve is hitting .298 so far. 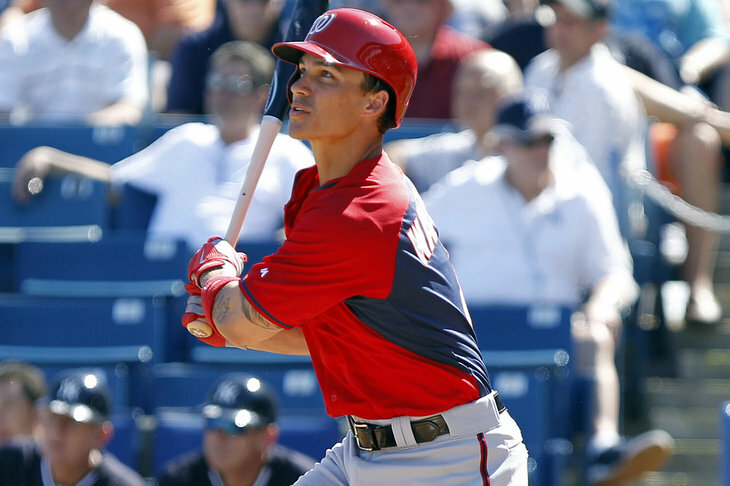 With the recent spate of injuries to the opening day roster, the Nats have called on several new bench players as well as Syracuse call-ups (i.e., Zack Walters– above) to show what they can do! With the bullpen tired from overwork in the Atlanta series they needed a fresh arm who could pitch long relief if needed. Blake Treinen filled that need, so space was made on the roster by sending Aaron Barrett down, since he had just pitched in consecutive games. Treinen has impressed with his ability to remain calm under pressure and get hitters out. No one doubts that “Bear” Barrett will return soon though. Zack Walters and Steve Souza, who both were outstanding in Spring Training, are already seeing playing time against The Marlins. Zack had his first “bomb” tonight (April 15) and Steve got his first major league hit! Catcher Sandy Leon is filling the roster spot of the injured Wilson Ramos, and he smacked his first major league homer last night (April 14)! Kevin Frandsen and Danny Espinosa are red hot with the bat and are seeing significant playing time. Danny is showing commendable calmness when hitting and has cut way down on strike-outs, compared to 2013. Though Frandsen has not played much in the outfield prior to this season, he showed his infield experience in Atlanta by back-handing a ground shot to the left-field corner (normally a double) and firing it to second quickly to hold the batter to a single! Both Tanner Roark and Taylor Jordan are in the starting rotation while Doug Fister comes back from injuries. They are showing good poise but need to lower their earned run averages. My next post will be about recent on field events. I promise! I’ve been waiting for the effects of the weekend games in Atlanta to wear off. Baseball is a simple game! Most of us who have played the game for more than a few years have been told this many times by coaches, players and others. What they are really trying to impart is this: If you want to really become a good player focus on just a few things, and trying to do them very well. Do not over-think what you are doing while in the middle of a game. Practice A LOT so that playing just becomes instinctual. Every time you are practicing have a few specific goals in mind. OK, here is an extra-choice question for the fans: How is baseball like investing in the stock market? Now that it has been a few days…Answer: Both baseball and investing can be very data analysis driven. For more information, click here for a great article on the topic of sports and investing By Bill Nygren–one of the best mutual fund managers in the business.